A mail-in ballot bill that could impact how Montanan's select their next congressman, is likely dead after a party line vote Wednesday morning. Democrats forced a vote on the bill in a House committee hearing, a move that blindsided some Republicans, who criticize the minority party’s tactics. "I was committed to vote yes to this. But because of the partisan railroad that just happened, I’m proud to vote to table it." Representative Barry Usher is a first term Republican from Billings. "I was in support of it because my county commissioners and I had long discussions and I had agreed to go along to save the counties money," Usher said, "although I personally think that it should not be an issue and we should find money within the state and the state should pay for it." Commissioners expect mail-in balloting for the special election could save counties more than half a million dollars statewide. Before lawmakers voted to tabled Senate Bill 305, Wednesday, Democrats on House Judiciary huddled in a hallway outside the committee room and discussed a strategy push the bill forward. The committee was not scheduled to vote on the bill. 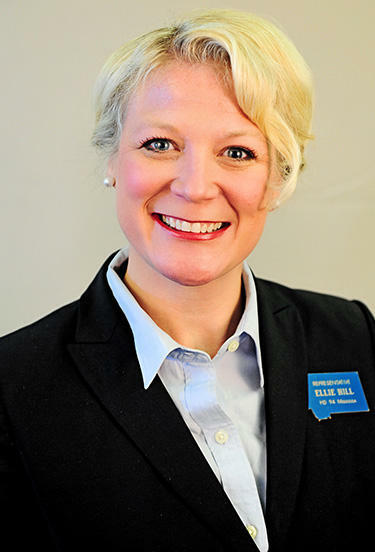 Rep. Ellie Hill Smith (D) HD-90. Missoula Democrat Ellie Hill sits on Judiciary. She says clerks and recorders from across the state were pushing for a vote on the bill. County election offices must send out mail ballots by April 10. "Why we haven't taken executive action on it already is purely their own partisan hijinks, right? They’re holding the bill with the intent that it would die," Hill said. "So whether we did it today or tomorrow or the next day or next week, it wouldn’t have mattered." The mail ballot bill got its first hearing in the House late last week, having already passed out of the Senate more than a month ago. Last Thursday, in one of most chaotic House hearings of the legislative session, dozens of clerks and recorders testified in support of the mail ballot option, saying it could save counties money while not hurting voter access. A Helena woman was escorted out of the committee room by the sergeant at arms for not obeying an instruction to keep testimony short. Opponents of the bill, including Montana’s Republican Secretary of State said the bill would jeopardize the integrity of the election, by removing physical polling site election judges from the process. People rural and Native American communities also objected to the bill out of concern of voter access. The chair of Montana’s Republican party has asked his party to kill the bill, saying it would help Democrats in the upcoming election. Regina Plettenberg, president of the Montana Association of Clerks and Recorders says counties are not in a good financial situation after paying for an expensive election last November. She also says the proposed bill would ease the pressure finding polling places for the election. When Democrats moved in committee Wednesday for a vote on the mail ballot bill, Great Falls Republican Theresa Manzella countered with an non-debatable substitute motion to table the bill. Senate Bill 305 was tabled without discussion. The bill now has a narrow path forward, requiring a blast vote in the House of Representatives. Meaning the 60 out of the 100 representatives in the House need to support it, which isn’t likely. "I don’t think I have 60 votes to make it fly, because so many people here are like, scared of party leadership so they won’t vote for it even though their constituents want it very badly,”said Geraldine Custer, a Republican from Forsyth. Custer originally requested the mail ballot bill. Custer says she was asked to not introduce the bill by the Republican Speaker of the House Austin Knudsen, Secretary of State Corey Stapleton, and GOP leadership. A spokesperson for the speaker's office confirmed that Knudsen encouraged Representative Custer to not introduce the bill, saying it was bad policy. The speaker has also voiced concern that the bill could be unconstitutional because it creates separate classes of voters. 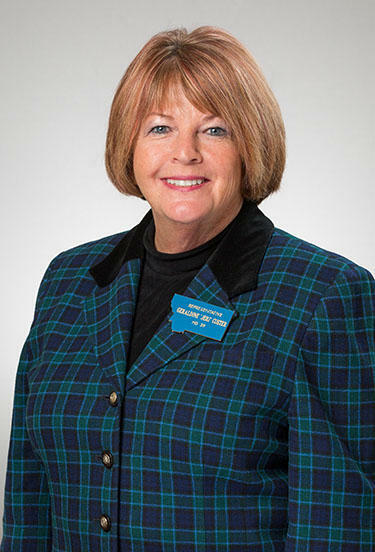 Rep. Geraldine Custer (R) HD-39. Representative Geraldine Custer says she was a county clerk and records for 36 years, and over that time she saw both Democrats and Republicans claim mail-in balloting helps the other party in elections. But she says that’s not true. Custer says she will try to blast the bill onto the House Floor, Friday, even if she doesn’t have the votes for it to work. "I just want to make them own their vote, because they have to run for election again and they were sent by their constituents, not the party," says Custer. Lawmakers on both sides of the aisle are blaming each other for the partisan handling of this legislation. It’s already passed out of the Republican controlled Senate 37-13. Representative Custer and Democrats who support the bill say they are working on whipping up votes for the bill’s expected blast on Friday. A bill intended to save counties hundreds of thousands of dollars in the upcoming special election for Montana's vacant U.S. House seat brought heated testimony and debate Thursday in the Capitol. A bill designed to save county governments half a million dollars or more is facing a time crunch in the state legislature. It would allow them to conduct mail-in only balloting. If it’s going to have any impact on how voters select the state’s next U.S. congressman, it must pass out of what one lawmaker is calling a kill committee. In less than three months, counties across the state will hold a special election to select a replacement for Montana’s now vacant U.S. House Seat. After Ryan Zinke was confirmed as Interior secretary in the Trump administration Wednesday, Governor Steve Bullock called a special election on May 25 — 85 days away. County election officials expect that election to cost about $2 million, split among Montana’s 56 counties. And most counties haven't planned or budgeted for that. Accusations of voter suppression are already flying ahead of Montana's anticipated special election. That would be held after Congressman Ryan Zinke vacates his seat, pending Senate confirmation of his appointment to become secretary of the interior.